Utah Trikes - The KMX K-3 - A Fun-Size Trike for Kids! We know how much you love triking, and we want your kids and grandkids to be able to enjoy it as much as you do! 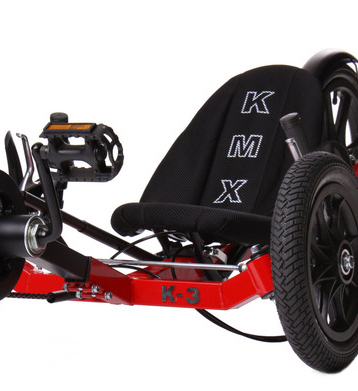 Make triking a family affair with the KMX K-3. KMX designed the K-3 with the smaller folks in mind, so you can be sure it�s a safe, reliable, and hassle-free way to entertain your kids with endless amounts of fun. It features the comfortable KMX bucket seat, a 2-speed drivetrain, and an adjustable seat and boom that allows it to fit many different riders. 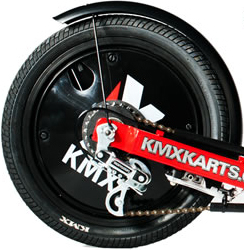 Like other KMX trikes, the K-3 features the comfortable, hardshell KMX bucket seat. The sides and bottom of the seat extend upward, a feature intended for comfort and safety. Because of the way the seat cradles the rider, it is more secure when cornering hard. The seat frame is steel, with foam padding, and a black breathable mesh cover that keeps riders cool and comfortable. Thanks to the adjustability of the K-3, you can easily fit it to a variety of smaller riders. You can share it between kids without getting frustrated with adjustment. There are two quick-release clamps that allow the seat to slide easily along the frame. The manufacturer rated rider weight is 145 lbs, and it will carry any rider that�s approximately four feet tall. Like all other KMX models, the K-3 uses Ackerman-compensated, direct steering. Something unique about the K-3 are the model-specific steering components that provide for responsive handling. The steering geometry gives the K-3 a heavy ride that�s classic of the KMX brand, and the sealed ball bearings gives smooth, uninterrupted control. The predictable and durable handling of the K-3 makes it ideal for younger riders. The drivetrain featured on the K-3 is hassle-free and low-maintenance which makes a relief for parents and grandparents, and perfect for kids. The 38T sprocket and 125mm one piece crank paired with the 2-speed, 24T - 18T rear cassette is perfect for kids cruising around the neighborhood or keeping up with family on the trail. It�s also geared low enough to get up hills so no one will be falling behind. As a concerned parent or grandparent, you�ll probably be curious about the stopping power of the K-3. Never fear, KMX has your kids taken care of. For the two front wheels, the K-3 features self-energizing hub brakes activated by a twin-pull lever, and a powerful locking rim brake for the rear wheel. The locking lever serves as a parking brake and will keep the K-3 stable as the kids climb on and off. As a concerned parent or grandparent, you�ll probably be curious about the stopping power of the K-3. Never fear, KMX has your kids taken care of. For the two front wheels, the K-3 features self-energizing hub brakes activated by a twin-pull lever, and a powerful locking rim brake for the rear wheel. The locking lever serves as a parking brake and will keep the K-3 stable as the kids climb on and off of. 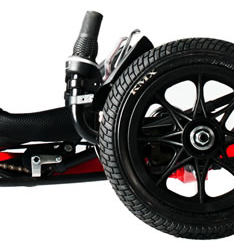 For the KMX K-3 the wheels come in a fun-size, yet heavy duty package. There are two 12.5-inch by 2.25-in front tires, and a 16-inch by 1.95-inch rear wheel. The rear wheel also has a disc cover for visual appeal and for safety. The K-3 features Schrader valves and KMX Fortune tires. They are built to last and are awesome for kids who love to cruise. If you live in an area that has a lot of thorns, you may want to consider a puncture protection upgrade, like Slime tire sealant. The K-3 comes stock with hand guards, a steel rear fender to keep kids clean, and a KMX flag that makes them more visible to other motorists. It is available as a kit as well which means you can spend quality time with your child or grandchild building their new trike! As far as upgrades are concerned, they aren�t really necessary. The K-3 already has everything a young rider will need to enjoy a trike outing. The KMX K-3 is in a class all its own. 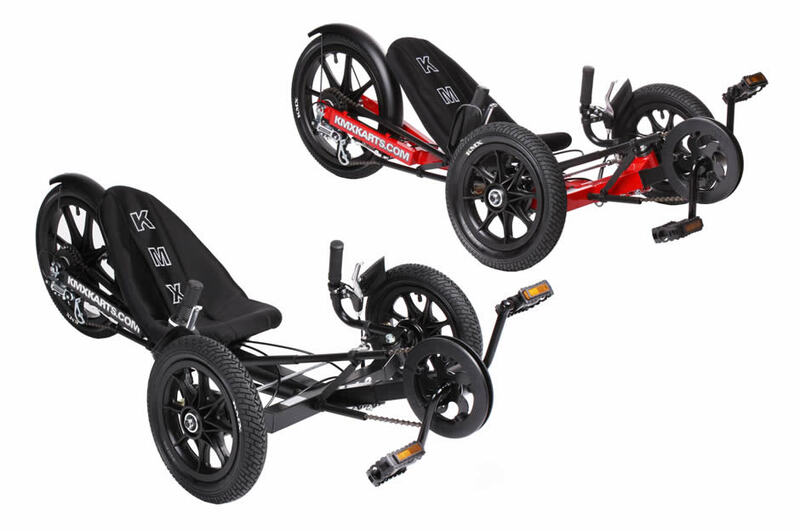 KMX has built the only recumbent trike made specifically for kids, created with safety and reliability in mind. Its low-maintenance, robust, and hassle-free design makes it a favorite of parents and grandparents that are looking to have a stress-free triking experience. The K-3 is quality, durability, and safety in a kid-friendly, fun-size package, and it�s sold at a price you can afford.